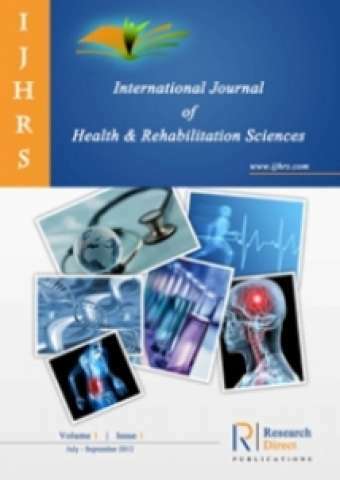 The International Journal of Health and Rehabilitation Sciences (IJHRS) is a Periodical of Jordan physical Therapy Society. JPTS is a non-profit health organization care about health and rehabilitation providers in Jordan. It is for physical therapist working in the area of Health and related areas. The mission ofJPTS is to promote the health and rehabilitation related awareness across the globe. IJHRS is an open access, Peer reviewed international journal devoted to the promotion of health and rehabilitation sciences (including Medicine, Dentistry, Pharmacy, Nursing, Physiotherapy, Occupational Therapy, Speech Therapy, Orthotics & Prosthetics, Biotechnology, etc). IJHRS aims to encourage multidisciplinary research and collaboration among scientists, the industry and the Healthcare and Rehabilitation professionals. It also provides an international forum for the communication and evaluation of data, methods and findings in Health and Rehabilitation Sciences.